of the deviation of the vertical, or the angle between the local vertical and the normal to a reference ellipsoid, are about 1 minute of arc. Maximum variations in the height between the reference ellipsoid and mean sea level (also called the geoid or equipotentiaI surface) are about 100 m, as illustrated in Fig. 5-8. 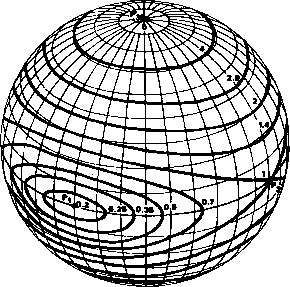 The coordinate transformations given here are intended for use near the Earth's surface to correct for an observer's height above sea level and are valid only for altitudes much less than the radius of the Earth. For satellite altitudes, the coordinates will depend on the definition of the subsatellite point or the method by which geodetic coordinates are extended to high altitudes. For a discussion of geodetic coordinates at satellite altitudes, see Hédman  or Hedgley .